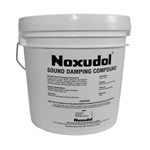 Here at SoundAway, we sell Noxudol damping compound for walls, floors and ceilings, as well as for heavy equipment and automotive applications. Noxudol is a viscoelastic damping compound that reduces sound vibrations by converting them into very small amounts of heat energy. This sound dampening compound is also a powerful rust protectant for under carriages of vehicles, exposed pipes, and any metal surface. Noxudol can be applied using an aerosol spray or with a paint brush or roller. Along with rust protection and sound reduction, this is a fire-resistant damping compound, as well. Noxudol has you covered on all fronts in this one, simple product! Noxudol viscoelastic damping compound is versatile, easy to work with, and provides years of protection against noise, rust, and heat. Order our 16 Oz spray cans or our one or five-gallon buckets to tackle even the biggest jobs. Enjoy our competitive prices with fast shipping or give us a call at 866-768-6381 to speak with our team of experts ready to help you craft the perfect custom order. Damping products lower the resonant frequency of vibrating surfaces.